Here is a revised edition of an award-winning biography that celebrates one of the most improbable lives of the twentieth century: a blind and homeless man who became the most famous eccentric in New York, rising to prominence in major label recordings in addition to symphonic concerts of his compositions. Moondog will soon be seen as a feature-length documentary titled The Viking of 6th Avenue directed by Holly Elson and produced by Hard Working Movies. Born Louis Thomas Hardin in 1916, Moondog first made an impression in the late 1940s when he became a mascot of the New York Philharmonic at Carnegie Hall. His unique, melodic compositions were released on the Prestige jazz label. In the late 1960s the Viking-garbed Moondog was a pop music sensation on Columbia Records. Moondog’s compositional style influenced his former roommate Philip Glass, whose preface appears in the book. Moondog’s work transcends labels and redefines the distinction between popular and high culture. 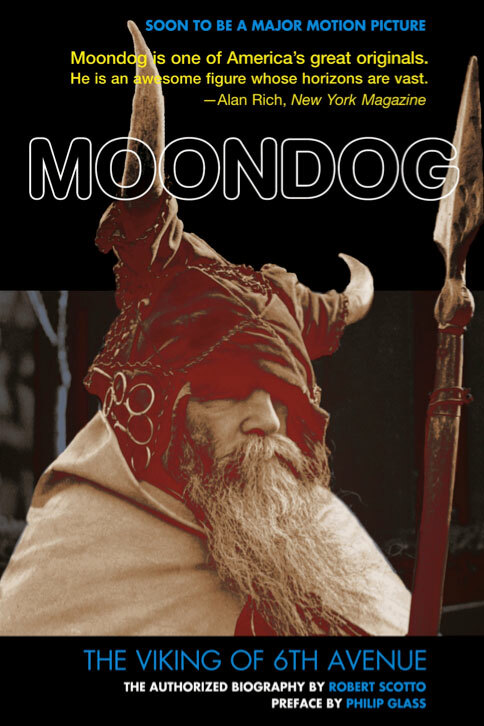 A wide-ranging compilation of Moondog recordings, which includes never-before-released Madrigals played by Philip Glass, Steven Reich, Jon Gibson, and Moondog himself, are offered as free downloads for every purchaser of this biography.